Batum टिकट, 1919 पर मुसब्बर पेड़. ↑ मुसब्बर पेड़ों की छवियाँ. ↑ अ आ Schmidt JM, Greenspoon JS (1991). "Aloe vera dermal wound gel is associated with a delay in wound healing". Obstet Gynecol. 78 (1): 115–7. PMID 2047051. ↑ Cosmetic Ingredient Review Expert, Panel (2007). 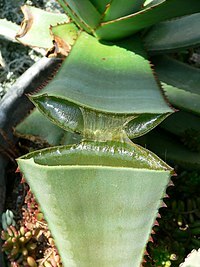 "Final report on the safety assessment of Aloe andongensis extract, Aloe andongensis leaf juice, Aloe arborescens leaf extract, Aloe arborescens leaf juice, Aloe arborescens leaf protoplasts, Aloe barbadensis flower extract, Aloe barbadensis leaf, Aloe barbadensis leaf extract, Aloe barbadensis leaf juice, Aloe barbadensis leaf polysaccharides, Aloe barbadensis leaf water, Aloe ferox leaf extract, Aloe ferox leaf juice, and Aloe ferox leaf juice extract". Int. J. Toxicol. 26 Suppl 2: 1–50. PMID 17613130. डीओआइ:10.1080/10915810701351186. ↑ Food And Drug Administration,, HHS (2002). "Status of certain additional over-the-counter drug category II and III active ingredients. Final rule". Fed Regist. 67 (90): 31125–7. PMID 12001972. ↑ "NAMIBIA - WINDHOEK". अभिगमन तिथि 2008-01-24.